The Accidental Locavore wants to know: can a recipe for green beans be passive-aggressive? It can’t, but like everything else that is grown and cooked, it picks up the qualities of its environment, what the French call terroir. This particular recipe for green beans didn’t start out passive-aggressive, it just got caught in the cross-hairs. Imagine, if you will, being asked to come up with a recipe for the following quote: “The Pilgrims made seven times more graves than huts. No Americans have been more impoverished than these who, nevertheless, set aside a day of thanksgiving” ~H.U. Westermayer. Certainly not your usual warm and fuzzy Thanksgiving missive. My first response was “Gee, that’s so upbeat, let me look for the rusty razor blades….” Meanwhile I’m thinking, what goes with seven times more graves than huts? Enter the humble green bean. But why is that passive-aggressive? First of all, the recipe was sent because it was easy (an earlier per-requisite) and I just wanted to fulfill my promise and forget about it. If you knew the Accidental Locavore really well, you would know that green beans, even when disguised as haricots verts, are not one of my favorite veggies. They’re fine, just not on the top-ten. Add to that the Thanksgiving tradition of green bean casserole and you’ve got all the sizzle of the aforementioned rusty razor blade. When I was describing this to a friend of mine, he just started laughing. “Passive-aggressive green beans, I love it!” So if you’re looking for three ways to cook green beans and they can be as passive or aggressive as you would like), click here. And let me know, am I over-reacting to the quote? Or annoyed by the explanation that “It should be an inspiration to those without jobs, those who have lost and may still lose their homes and jobs. Those who miss being able to shop, shop, shop.” Isn’t a better message what Marcus Samuelsson posted on Twitter: “When a person is down in the world, an ounce of help is better than a pound of preaching.”? 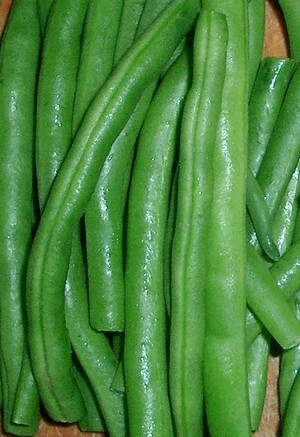 Love “the humble green bean”. Humble enough to take on being passive or aggressive! Or, a host of other energies!